Attention: Version 5 of MathRider has been released. MathRider is a game that takes you into a land of magical adventures where fun, excitement and great rewards await, while helping you to achieve perfect mathematics skills in your times tables and division. The main game is played riding through the Mathlands. 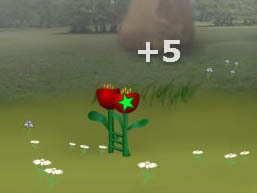 The Mathlands contain various different magical realms where you need to jump over obstacles by answering questions (number sentences) correctly. As detailed in the System Requirements, MathRider requires a minimum resolution of 1024 by 768 pixels. If you find your screen too small, it is usually because your screen resolution is set to be too low. If you own a netbook, you may not be able to increase your screen resolution, as these devices typically come with 1024 by 600 displays. This is where you navigate to all other areas of MathRider. At the top you see your name and some overall statistics of your rider. The quest buttons may not all be available at all times. When you first come to the main screen and have not created any quests, none of the quest buttons will be available. Similarly, once you have completed your current quest, the ‘Continue current quest’ will not be there. Click on the following video to watch a walkthrough on how to create riders in the game. The next video shows how you can modify existing riders or switch between them. MathRider is quest based. All math practice is tied into one of four quest stories. These stories are designed to provide players with a more meaningful experience and set the scene for being rewarded upon completing the quest. Click on the following video to watch a quick explanation on how to create quests. There are three basic quests in the game. One for easy, one for medium and one for advanced difficulty. At the end of the advanced level quest there is a further Master level quest. Each quest involves the rider in a storyline with a need to ride through the Mathlands for great and noble causes. It is highly recommended that you start with the easy level quest in the operation of your choice (addition, subtraction, multiplication or division) and move up from there. If you are already quite expert in say addition, you may go straight to advanced, however then you will also miss out on the rewards that the addition easy and addition medium quests offer (more on quest rewards below). The Master level quest only becomes available once the rider has acquired mastery over an operation. For example, once you have completed the advanced multiplication quest with 99% or better mastery, the king will have a special request for you, making the master level quest in multiplication available to you. We highly recommend letting your kids play the quests in succession from addition-easy through to addition-master, then subtraction-easy to subtraction-master, and so forth. This has been shown in all our trials to be the fastest, most rewarding way for kids to master their fundamental operations. The following video elaborates on this and also explains why the game only allows one active quest per player at a time. At the end of a quest, a cool reward is bestowed upon the rider. The nature of the reward depends on the quest. While each operation (addition, subtraction, multiplication and division) uses the same four quest storylines, each combination of operation and quest has its own unique reward. The rewards become available on the main screen and are animated. The level of animation depends on the level of mastery the rider has accomplished in their quest. For example, on an easy addition quest, the rider needs to answer addition questions using numbers between zero and five. If the rider answers all of them well, the rider’s mastery level will be 100%. The reward will then be fully animated. If the quest mastery level is say 80%, the reward will only be a little animated. If the mastery level is below 75%, the reward will still be there, but it won’t be animated. In this way the game provides incentives to the riders to not only complete quests to get rewards, but to complete the quests well. Note that the master level quest holds the greatest honour and reward that the game has to offer. The kids are usually very excited when they get this, and wild dances of joy are not uncommon. This is where all the action happens! Be it practice or quest, this is the screen where you and your horse Shadow jump over obstacles as correctly (and quickly) as possible. As soon as you know the answer to a question, type it into the answer box under Shadow, and press the <Enter> key on your keyboard. If you notice a mistake before you press the <Enter> key, use the <Backspace> key on your keyboard to remove and then correct your answer. If the answer is correct, the horse will be able to jump over the obstacle. If there is no correct answer by the time the horse reaches the obstacle, the poles on the obstacles will blow up and the rider’s score will be reduced by one. Also, the horse will stop running in order to avoid the explosion, costing the rider precious time. There are two measurements of performance in the game: time and accuracy. The faster you can clear obstacles, the better. The fewer obstacles are failed, the better. A quest is completed by scoring a certain number of points. Usually 1 point is awarded for every cleared obstacle. However, there are also bonus points available, awarded for accuracy and/or speed. Bonus points can make your game progress much, much faster. Bonus points are indicated by rotating stars on the obstacles. Try not to press <Enter> when you know it is the wrong answer. Submitting a wrong answer will mean the count of correctly answered questions in a row will be reset to zero. This may cost you many bonus points, and it may also slow down your riding speed. At the end of a ride, additional time bonus points may be awarded, if the rider answered questions quickly. 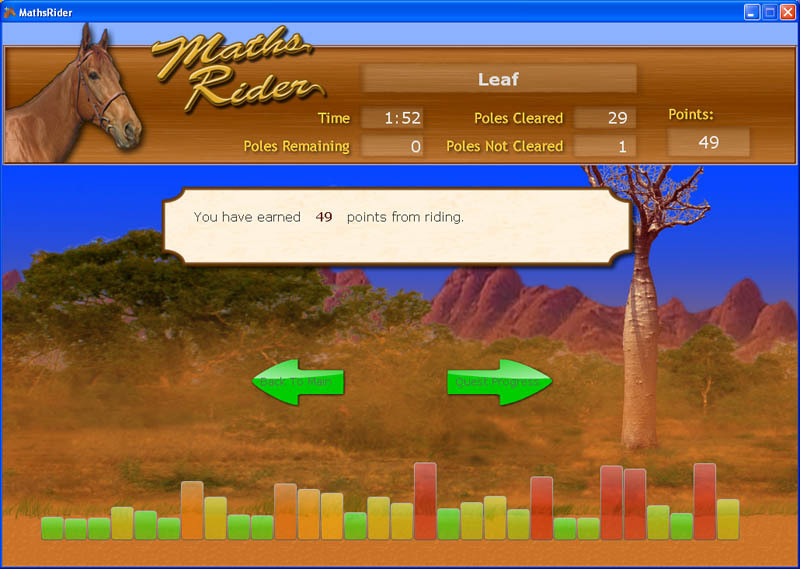 The time bonus is independent of whether the rider made any mistakes during the riding or not – it is purely based on the overall time used versus how much time the game expected the rider to ideally use. This means that the game will award bonus points even to relatively slow riders as and when they improve their riding speeds. Obstacles will have between 1 to 5 cross bars. The number of cross bars indicates the degree of difficulty of the number sentence to the rider, based on the rider’s past answers. If a number sentence has never before been attempted by the rider, the obstacle will have three cross bars. The horse has in-built intelligence to adjust its speed correspoding to the rider’s performance. If the rider answers questions quickly, before they get near the horse, the horse will speed up. If the rider answers questions only when they are quite close, the horse will slow down. If questions are answered around the middle area of the screen, the horse will not change its speed. The horse may also adjust its speed if the average answer time of a question is longer than the current speed would allow for. In that circumstance it would slow down. Note that there is a minimum speed, beyond which the riding speed will not be reduced. A ride in MathRider always consists of 30 questions that need to be answered. At the end of every ride, the Riding Results are shown, as per the following screenshot. The Riding Results show the results of every question that was asked in the ride as a series of vertical bars. The bars are colour coded. Green indicates quick (or quicker than before) answers, whereas yellow and red indicates that the question did not get answered as well as before. This is probably the most important screen for parents and educators. Every question that is anwered during a quest is recorded in the MathRider database. Based on all these questions, the ‘My Statistics’ screen shows a visual presentation of a rider’s current strengths and weaknesses. If you are a rider, here you can assess your strengths and weaknesses, and prepare for your next ride. Or, if you are a parent, here you can work out how your rider is going overall and what (if anything) your rider most needs assistance with. Following is a screenshot of a sample Statistics screen for our rider for multiplication. This screenshot has been taken fairly early into the medium multiplication quest of MathRider. In the above screenshot we see our rider has got a whole range of coloured squares for multiplication. The colours indicate the relative challenge level of a question. For example, you can see that 0 * 0 is coloured green, while 5 x 12 (row 5, column 12) is coloured red. Also a few squares are yellow/orange, such as 3 x 9 (row 3, column 9). Lastly, there are a lot of squares in grey colour. This means that overall our rider is going quite well, but has had two questions that did not get answered, and a few that got answered after a significant delay. The Top Challenges box on the right displays the top five challenges in any given operation for the rider. Note that the first question during a ride will always be one of the top 3 most challenging questions. So it really pays for riders to pay attention to this table. Also, you can click on any of the questions in the table, and the corresponding square in the matrix grid will be highlighted. The Top Challenges box shows the five questions that the rider finds most challenging. It is possible that fewer than five questions (even none) are displayed in this box. That means that the rider has no real challenges in the selected operation at present. 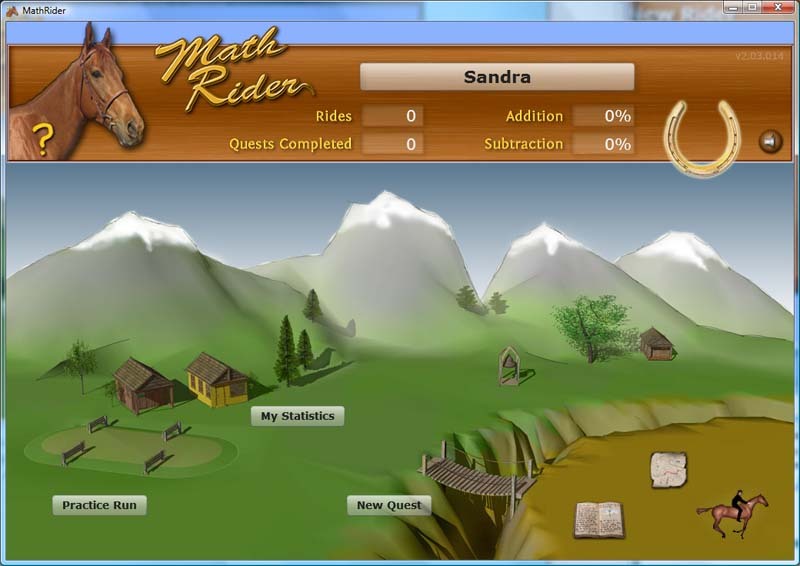 Hint: Every riding course will always start with a number sentence picked from the top three challenges, as shown in the Rider Statistics screen. Learn these well, and you will always be off to a flying start! The Mastery Level Bar indicates the level of mastery the rider has achieved for the selected operation overall. 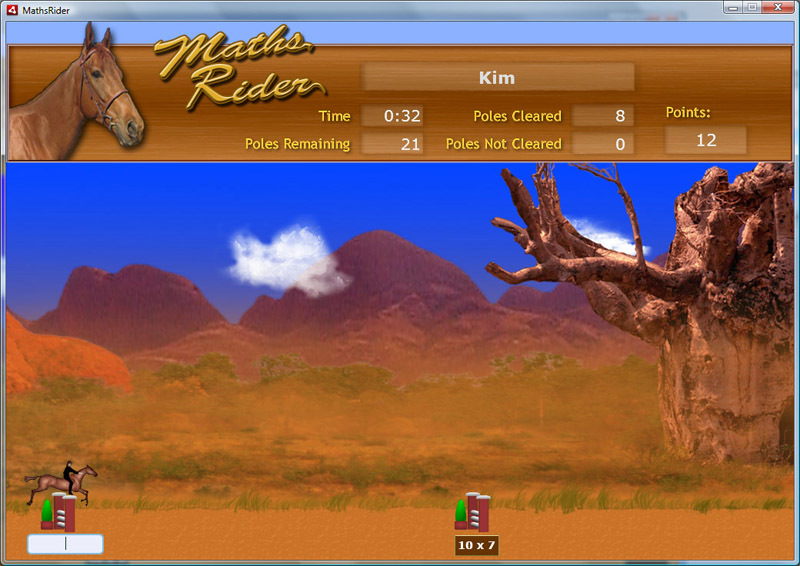 In the following screenshot, the rider has achieved 40% mastery of subtraction. This means that 60% of all subtraction questions in the game have either not been tried yet, or have been answered more or less slowly or incorrectly. The Mastery level in the Statistics screen always shows the current overall Mastery Level for an operation. 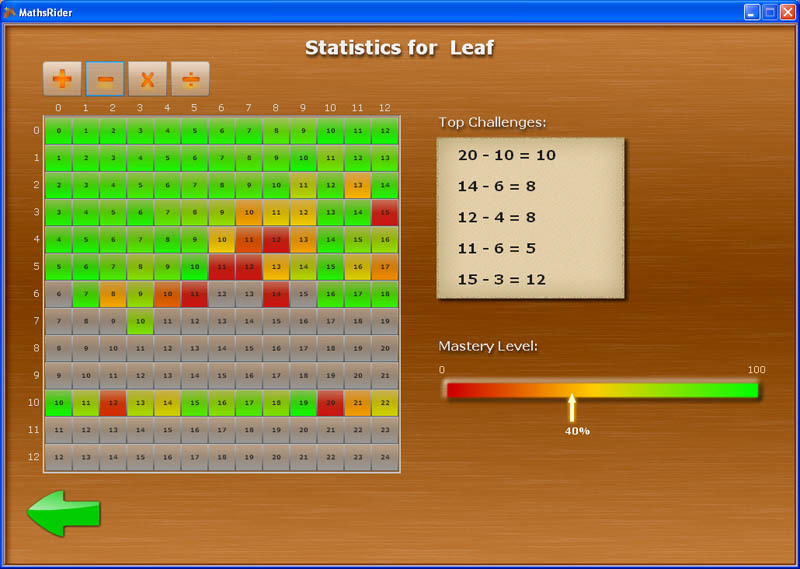 The Quest Mastery Level computes mastery based on only the range of questions that are available within that quest. Got further questions about the game? Please drop us a line, using the contact form below. We’d love to hear from you!